Amid stagnating union membership rolls across the country, the American Federation of Teachers added 40,000 education employees into its ranks last week. AFT reached an affiliation agreement with the Asociación de Maestros de Puerto Rico, the exclusive bargaining agent for the island’s public school teachers. It represents a unit larger than the Chicago Teachers Union. But the affiliation is a unique one, characteristic of the difficult and often combative relationship between American unions and Puerto Rico’s teachers. For one thing, AFT and AMPR describe the new relationship as a “trial affiliation” of up to three years. This is an unprecedented arrangement, in my experience. Second, AMPR will be charged national dues of only $1 per member per month. AFT affiliates on the U.S. mainland, by way of comparison, will pay $19.28 per member per month beginning in September. AMPR members’ dues will remain stable because their union pledged to pay AFT’s fee from its own coffers. For its part, AFT pledged to provide AMPR’s members with the same services it provides all other members. AMPR became the bargaining agent for teachers in Puerto Rico in April 2016 after an election in which its rival, the Federación de Maestros de Puerto Rico — FMPR — was banned from participation. The two unions have been battling since public-sector collective bargaining was enacted in Puerto Rico in 1999, even as America’s unions have treated the island like their own little Game of Thrones. Back in 1999, AMPR was affiliated with the National Education Association and FMPR with AFT. FMPR won the first union representation election — the right to negotiate the island’s teachers contract — giving AFT the upper hand and all but eliminating NEA’s presence in Puerto Rico. In 2003, a radical caucus won election to FMPR leadership and began disaffiliating from AFT. In what has since become standard operating procedure, AFT first sought to have the FMPR president removed from office, and then, in 2005, attempted to establish a trusteeship over the union. This was met with massive defiance and protests that reached all the way to an AFT conference in Washington, D.C.
After losing several court battles and failing to form a competing organization, AFT effectively surrendered, disaffiliating FMPR — as if FMPR had not already disaffiliated itself. FMPR’s victory was short-lived, however. After it authorized an illegal strike, the government of Puerto Rico decertified the union in 2008 and called a new representation election. With FMPR legally sidelined, AMPR rose from its ashes, assisted by a new affiliation with the Service Employees International Union. Teachers were given the choice of AMPR or no union, and 55 percent of them voted for no union. That ended SEIU’s involvement and left the island’s teachers without any union representation. Labor militancy continued, however, with both FMPR and AMPR participating in strikes and protests in 2014, but it wasn’t until last year that the government allowed a new representation election to be held. With FMPR barred from participating, AMPR easily won. AFT gets a morale boost from taking AMPR under its wing, but not much else. 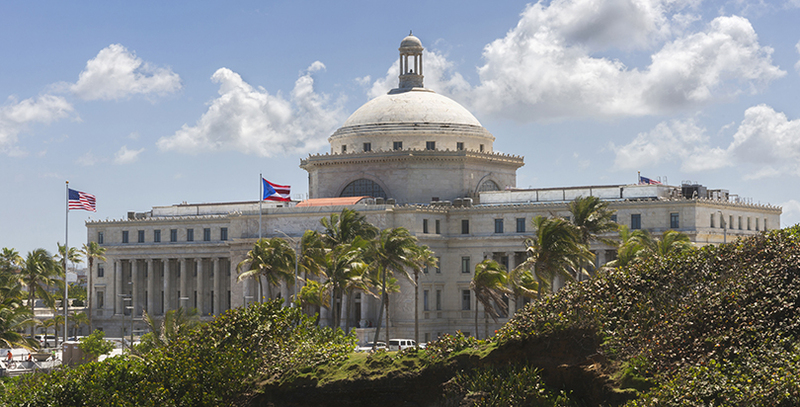 Puerto Rico doesn’t permit the collection of agency fees. All union dues are voluntary. Even if every teacher were to join, the annual take for AFT would be less than $500,000, not enough to cover the cost of three union staffers. Perhaps AFT members will think it is worthwhile to subsidize union operations in Puerto Rico, but AFT isn’t likely to ask them.